Thermal infrared sensors have been used by researchers to measure crop canopy temperature and relating the temperature measurement to water stress. For example, infrared canopy temperature was used by Jackson et al. (1981) to estimate water stress in annual crops such as wheat. The canopy temperature method was also applied to irrigation scheduling for cotton production (Wanjura and Upchurch, 1997). Using canopy temperature measurement, the canopy to air temperature difference was correlated to the vapor pressure deficit in peach trees and used to reference stomatal responses to water stress (Glenn et al., 1989). Approximately 10,000 ha of commercially-grown peach trees in central California depend on irrigation as the primary source of water in the peak summer growing season. A potential solution for managing water shortage is to use deficit irrigation during postharvest growth stages and to use thermal infrared sensors to monitor water stress in near real-time. In a multi-year field study, an early-maturing peach was irrigated using furrow, drip, and micro-sprinkler systems under both full and deficit irrigation schemes. The trees were early-ripening “Crimson Lady” (Prunus persica (L.) Batsch) peach on “Nemaguard” rootstock. During the growing season, stem water potential was measured weekly or bi-weekly from both the full and deficit irrigation blocks. Infrared temperature sensors were installed in the orchard in both the full and deficit blocks irrigated by furrow, drip, or micro-sprinkler methods. These temperature sensors were mounted on galvanized metal pipes extending above the tree canopy. The center of field of view for each sensor was aimed at the middle three trees of the center row for each measurement block. A datalogger system was used to record temperature readings at 15 min internals and readings were averaged to hourly outputs for each growing season. Thermocouples were installed in the orchard to record air temperature at the same frequency as the infrared sensors, and hourly canopy-air temperature difference was computed. A linear regression was made between the canopy-air temperature difference and stem water potential measurements. 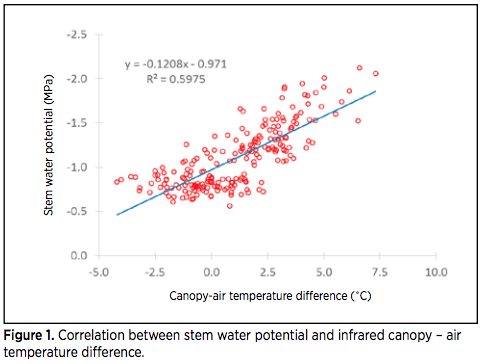 Correlation between stem water potential and canopy-air temperature difference showed a significant relationship (R2 = 0.6) where more negative potential values corresponded to larger canopy-air temperature differences (Figure 1). This is expected because when plants are under water stress, stomatal resistance increases thus stem water potential is more negative. At the same time, transpiration decreases thus the canopy could be at higher temperature than the ambient air due to reduced evaporative cooling. The graph also indicates that infrared temperature measurement is not sensitive to stem water potential variations in the range of -0.5 to -1.0 MPa. This may imply that the infrared canopy temperature approach is applicable to water stressed conditions such as under deficit irrigation, but not sensitive to well-watered situations. The regression equation was subsequently used to guide irrigation scheduling (Zhang and Wang, 2013). Figure 1. Correlation between stem water potential and infrared canopy – air temperature difference. Peach fruit was harvested each year by a commercial contract crew following typical farming procedures. Only marketable fruits were harvested and a total of two to three picks were used during each season. The total fruit weight per tree and number of peaches per tree were measured for each treatment block. Average weight per fruit or fruit size was obtained by dividing the weight per tree with number peaches per tree. Fruit yield (weight per tree) under different irrigation treatments is shown for each year for the multi-year field study (Table 1). For furrow irrigation there is no significant difference in yield between full and deficit irrigation except in 2011 and 2012. For drip, the difference is significant in 2008 and 2015. For micro-sprinkler blocks, no significant difference was found in fruit yield. *Different letters indicate significance at P < 0.05 using the Tukey’s studentized range (HSD) test. ** na = data not available. 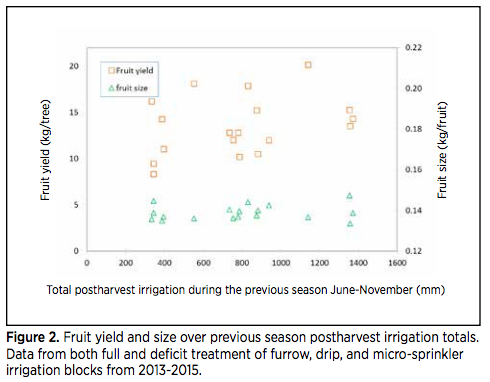 Average fruit yield and size of fruit from 2013 to 2015 over furrow, drip, and micro-sprinkler methods showed no significant change when cumulative irrigation increased from an average of 360 mm to 1360 mm during the postharvest season of 2012-2014 (Figure 2). The average fruit yield was 11.9, 12.9, and 14.3 kg/tree when previous year postharvest irrigation totals was 360, 823, and 1360 mm, respectively. The large variation in yield from year to year was attributed, at least partially, to orchard management practices such as annual pruning and fruit thinning (see also Table 1). The size of fruit remained nearly constant at approximately 0.14 kg/fruit. The multi-year study has demonstrated that deficit irrigation and infrared thermal sensing are potential management strategies for reducing overall crop water use and monitoring tree water stress. Peach treewater status can be estimated from thermal infrared temperature sensors in real-time, and the remotely sensed temperature data correlated to stem water potential measurements using the pressure chamber method. Future work includes determination of optimum amount of water deficit that can be used without causing unacceptable yield losses. Glenn, D.M., Worthington, J.W., Welker, W.V., and McFarland, M.J. 1989. 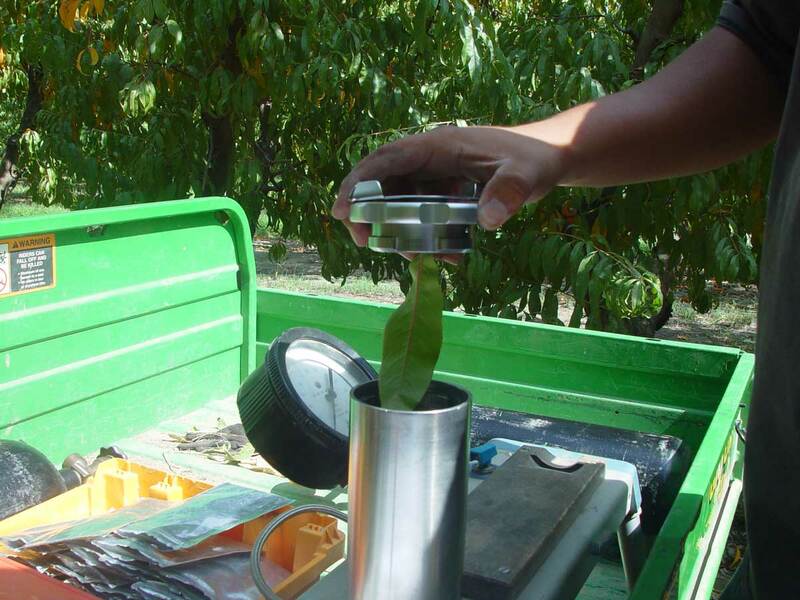 Estimation of peach tree water use using infrared thermometry. J. Am. Soc. Hort. Sci. 114:737-741. Goldhamer, D.A., Fereres, E., Mata, M., Girona, J., and Cohen, M. 1999. Sensitivity of continuous and discrete plant and soil water status monitoring in peach trees subjected to deficit irrigation. J. Am. Soc. Hort. Sci. 124:437-444. Jackson, R.D., Idso, S.B., Reginato, R.J., and Pinter, Jr., P.J. 1981. Canopy temperature as a crop water stress indicator. Water Resour. Res. 17:1133-1138. Wanjura, D.F., and Upchurch, D.R. 1997. Accounting for humidity in canopy-temperature-controlled irrigation scheduling. Agric. Water Manage. 34:217-231. Zhang, H., and Wang, D. 2013. Management of postharvest deficit irrigation of peach trees using infrared canopy temperature. Vadose Zone J. 12(3): doi:10.2136/vzj2012.0093.